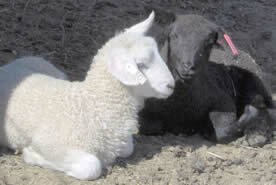 A short distance from the heavily-traveled Woods Hole Road are the tranquil pastures of Peterson Farm, where sheep graze. Surrounding the fields are pine and oak woods with trails that connect to Beebe Woods and Miles Pond, also known as Ice House Pond. Peterson Farm was purchased by the town in 1998. Because the Petersons benefited from a Chapter 61A farmland tax abatement, they were required to offer the town the right of first refusal when they decided to sell the 88-acre farm. A buyer was waiting in line if the town didn’t approve the purchase in 120 days. That pushed The 300 Committee into high gear. In short order, the land trust raised $500,000, including $100,000 from Salt Pond Areas Bird Sanctuaries, Inc., to contribute to the $3 million purchase price. The state contributed another $500,000 in state Self-Help reimbursement funds. One of the oldest farms on Cape Cod, the land was granted to John Weeks in 1679 and was farmed by the Weeks family for almost 300 years. They raised cattle and sheep and maintained orchards and cropland. Wool was the primary source of income for most of the farm’s history, so when demand for wool declined in the late 1800s and early 1900s, family members turned to other occupations. The farmhouse was finally abandoned and torn down. The foundation to the barn still exists beside the path to Miles Pond. In 1949, the farm was sold to Captain John Peterson, who grew vegetables and fruit on the land for his Cape Codder Hotel. Today, the town uses the sheep not for their wool but for the practical purpose of keeping the grass and invasive plants “mowed” so that the fields remain open. New shepherds Simon Thorrold and Diana Wickman have recently brought a new flock of hair sheep to the farm and are hoping to add some wool sheep later on, with the intent of using the sheep to train their border collies. 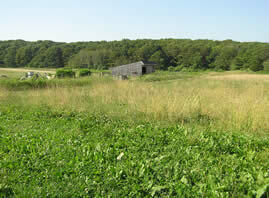 The farm has abundant natural resources, with pond, marsh, grasses and woodland. Deer, fox and coyote visit the fields in search of food, and otter live in the marsh. The variety of birds, especially migrating birds, makes the farm a popular spot for birdwatchers. A large-format, detailed map and trail guide of Peterson Farm and the adjacent Beebe Woods are available at The 300 Committee office.